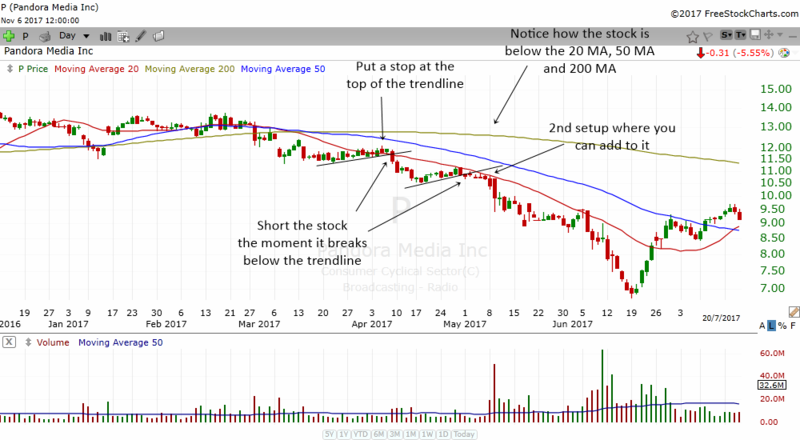 The break uptrendline at 20 MA is a swing trading strategy that catches the stock before it collapses. The break uptrendline at 20 MA is a chart pattern that I notice time and again in stocks that are about to fall. It has some similarities to the Break Uptrendline At Resistance chart pattern but the difference is where the pattern happens. This chart pattern happens at the declining 20 MA instead of price resistance. In order to fully appreciate this chart pattern, you need to know first of all what is a trendline. 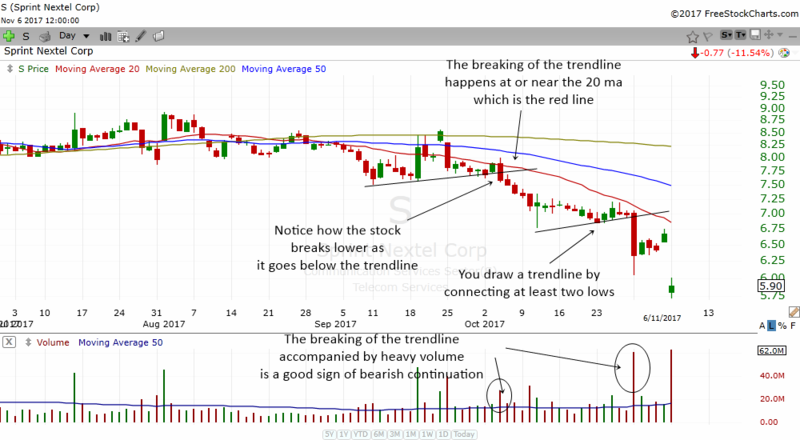 An uptrendline is a line that connects a series of lows as the stock climbs higher. On the other hand, a downtrendline is a line that connects a series of highs in a stock that is drifting lower. In today's article, we will be focusing on the uptrendline. The diagram above shows how you can draw an uptrendline. You draw an uptrendline by connecting as many lows as possible. The theory behind the trendline concept is as long as the stock stays above the uptrendline, it is considered to be healthy. However, when it drops below the trendline, the stock is in for some correction. Some stocks may even start to crash and go lower very fast the moment it breaks the trendline. Let me now show you how the "Break Uptrendline At 20 MA" chart pattern looks like. The name itself is self explanatory and you will immediately understand why I call it this name. Which is why I gave it the name "Break uptrendline at 20 MA" chart pattern. Do note that the 20 MA will be declining and sloping downwards. This is a sign of bearishness. The stock need not meet the 20 MA although meeting the 20 MA would be the best. All that the stock needs to do is be very near the 20 MA. The chart above is the daily chart of Sprint. This stock had 2 Break Uptrendlines At 20 MA chart pattern happening in a short span of time. Notice how the stock broke below the uptrendline each time it is near the declining 20 MA. The moment it breaks below the uptrendline, the stock continued to move lower. This gives the trader a very good swing trading opportunity to short the stock. If the breakdown is accompanied by heavier trading volume, it is usually a good sign of a bearish continuation. At first glance, it is quite simple for any stock to exhibit this chart pattern. However, we want the best trading opportunities and therefore I would like to impose some strict criteria for a stock to form a valid Break Uptrendline At 20 MA chart pattern. These are the criteria that you want to see in a stock that exhibits this pattern. You will soon understand why I inserted these criterias. The reason why I imposed those criterias is because I want you to be able to find a trading candidate that follows the trend. When you trade with the trend, you tend to be able to get better risk reward trades. You will also find that trading with the trend is more profitable than trading against the trend. Remember the saying "The Trend Is Your Friend"? First of all, we are looking for a stock that is drifting lower or in a downtrend. The chart pattern is actually a bearish continuation pattern. Continuation patterns are what they mean. They help you identify a stock that will "continue" to move lower. A stock that is below its 20 MA, 50 MA and 200 MA and is drifting lower is a stock that is not healthy. Actually when a stock is below these moving averages, it is considered to be very bearish. Sometimes you will see the stock having heavier volume as it breaks down. You might not be able to see it on the day of the breakdown as it is happening. After the closing bell, you might be able to see a slightly heavy volume on the chart. If you see that the volume is heavy, it is a good sign that the stock will continue to drop lower. Heavy volume as the stock breaks the trendline shows there are lots of people selling the stock. As a result of that, the stock is more likely to drop lower. Once you have found a suitable trading candidate, the next thing you need to do is to enter it. We do not simple enter the stock how and when we like. We need an entry rule. 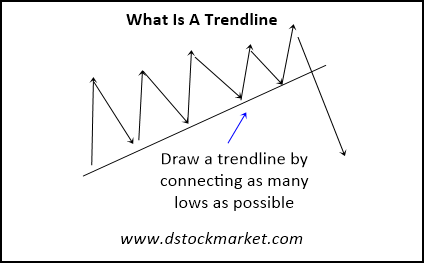 In order to be able to enter the stock correctly, you will need to draw a trendline. I have shown you how to draw the trendline. The trendline should be clean and connect as many lows as possible. The very minimum low should be 2. Otherwise it would not be a valid trendline. 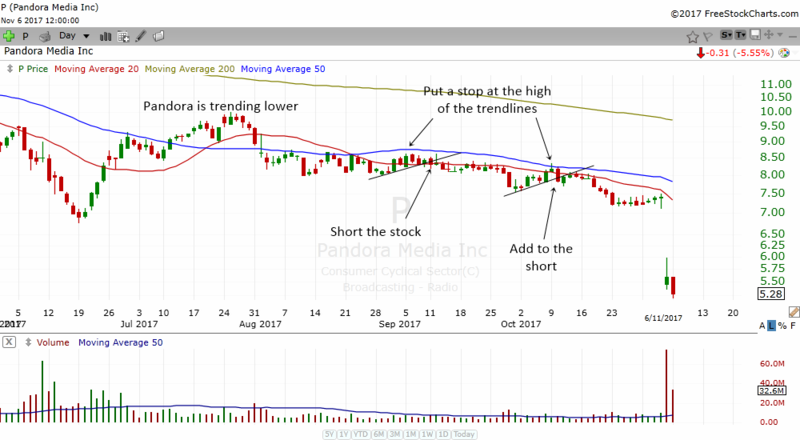 The chart above is the daily chart of Pandora. We have a trading setup in early April. The stock definitely satisfies the criterias. The stock is below the 20 MA, 50 MA and 200 MA and it is already drifting lower prior to the setup. We then draw a trendline and traders can short the stock the moment it trades below the trendline. If you look at the example above, you will be able to see a second setup happening a month later. The beauty of a trend following system is that you can often find other trading setups in the near future. Because the stock is trending lower, there will often be another opportunity to short the stock. Traders can often add to the short when they see another setup. Once you have entered into a position, it is time to start thinking about putting a stop loss. Stop losses are important because they allow the trader to control the amount of losses. While we can never control the direction of a stock and how it behaves and reacts, we can control ourselves and how we take losses. If you do not have a stop loss, you are exposed to unlimited losses. Since we are shorting stocks, in theory, the stock could go up and up and up and your losses will be very big if it does so. You can choose to put the stop loss 0.05 or 0.10 above the highs of the trendline. That way you will probably avoid some whipsaws. The chart above is the same stock Pandora. However, we fast forward it to a few months later. Notice how a stock that is in a downtrend continues to move lower? Which is why I mentioned above that this trading strategy is a trend following strategy. Once you have identified a suitable candidate, it is very likely to move lower and lower. Pandora gave another 2 trading setups. Once again, the trader can draw an uptrendline and short the stock once it breaks below the uptrendline. You can put the stop loss at the highs of the trendline. A few weeks later, the stock gave us another setup. Traders who are already short the stock can add to the short. Look at how much the stock has fallen. From around $8.50, it fell to $5.28. The stocks that fit our criteria are in a downtrend. Usually these kind of companies are having some issues with their fundamentals. Either they lack earnings growth or their earnings and sales are declining. They are probably losing out to the competition or are having a problem in their industry. Which is why they slowly drift lower and lower as time goes by. If you are in a profitable position (which will be the envy of many traders), it is time to start to think of how to take profits. A well rounded trading strategy will always have an entry plan, a stop loss plan and also a take profits plan. That in essence is what a good trade management will help you do. So, how do you take profits using this trading strategy? Always remember that the trading strategy that I'm teaching you here is a TREND FOLLOWING trading strategy. Therefore, it will be good for you to be a bit slow in taking your profits. But eventually, you will need to start taking profits because not all stocks are going to go to zero isn't it. There might come a time when they will rebound back up. Sometimes way past your entry point and turning your winning position into a losing position. There is no one size fits all rule that you should adhere to. The above are some ways to take profits. The important thing is never to let your winners turn into losers. Which is why I always recommend that you move your stop loss to breakeven (your entry price) once you have a comfortable amount of profits. 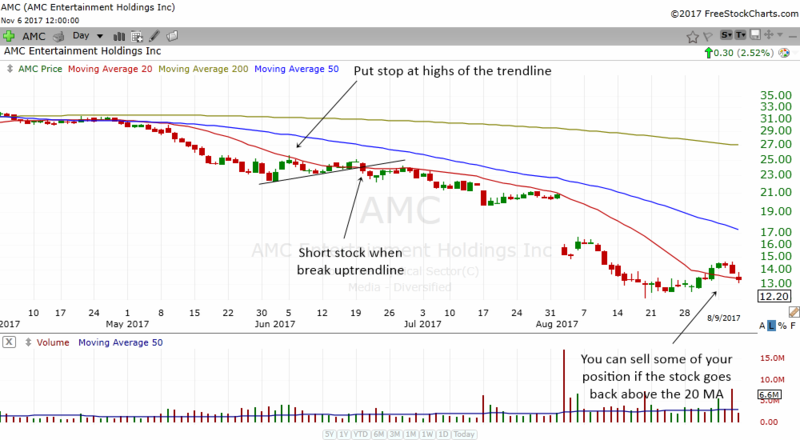 The chart above is the daily chart of AMC. It fits all the criteria for the trading setup. It provided a trading setup in mid June 2017 and the trade would have given traders a very nice and comfortable profit. Since this is a trend following trading strategy, we should be a bit slow in taking profits off the table. The patience paid off when the stock went lower to $13.00. That is a very respectable risk reward we are talking about. So, how do you take profits on this one? Well, you can start by selling 1/2 or 1/3 of your position when it trades back above the 20 MA decisively. That happened in September and you would probably have sold off 1/2 of your position. The other 1/2 we can ride it lower and hold it as long as the stock stays below the declining 50 MA. 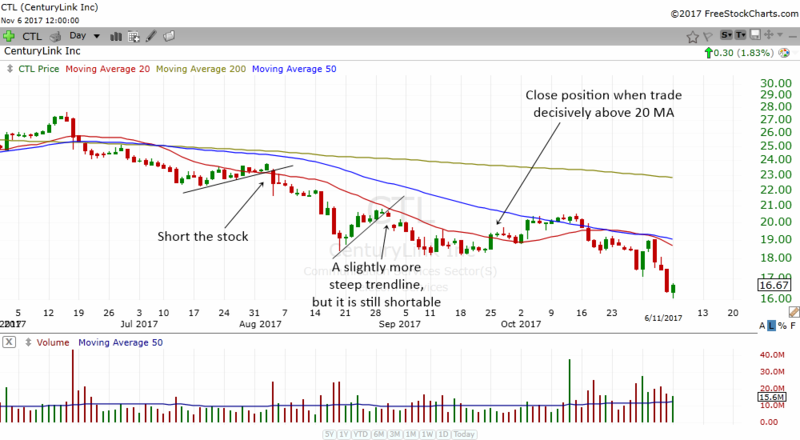 CTL above is another example where the declining 20 MA and 50 MA would have gotten you out of the position a bit early. This stock gave 2 trading setups. One around early August 2017 and the other one in late August 2017. The first one is the normal ones that we see but the second one is a bit different because the trendline is a bit steeper. But it does not matter as long as the stock breaks below the trendline. So, the trader can short the initial setup and add another short in the second setup. Notice as the stock traded, it moved sideways which is an indication of momentum slowing down. Then the stock traded above the declining 20 MA decisively. At this moment, the trader can sell 1/2 of all his or her positions and then put the other half at breakeven. The breakeven will be the average shorting price for both setups. The stock tried to rally and even went back up above the 50 MA for awhile. But I think it will not have touch the breakeven stop loss, which is a good thing because the stock eventually succumb to the law of trend following and moved lower. That my friends is how you manage a trade. Congratulations on learning another trading strategy. We have quite a lot of trading strategies for you to learn and discover in the Trading Strategies Section. The strategy that you have just learned is a bearish continuation trading strategy which takes advantage of a stock that is in a downtrend. Hope that you will find this lesson here valuable and have a great trading journey ahead!